In 2014, Austin, his wife Dani, and his sister Samantha built a 2,900-square-foot cheesemaking facility on the hillside overlooking the farm. They focus on making Italian-inspired cheese in Cedar Grove, North Carolina. They source milk from small local farms - Jersey and Holstein cow's milk from a long-time neighbor and Alpine, Nubian, and Sannen goat's milk from a friend's farm. They also have their own goat herd with plans to milk in the spring of 2019. Local cheesemaker Alessandra Trompeo joined Samantha in the cheese room, where they spent months experimenting and taste testing. The two women traveled to northern Italy, Alessandra's birthplace, to study styles of cheese. The result is unique handmade cheeses inspired by the small country farmsteads of Italy. They include 100% cow's milk cheeses as well as mixed-milk cheeses, a new style in their region. Samantha's move to North Carolina 11 years ago led to work in the best creameries in the state. For over a decade, she made cheese, worked at the area's top restaurants, raised goats, and helped with the ventures at Boxcarr Farms. 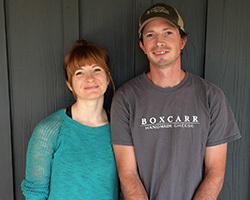 Samantha now brings her energy, heart, and vision to Boxcarr Handmade Cheese. She is a true entrepreneur, dreaming much bigger than most, never afraid to do whatever it would take to build a family creamery from the ground up. Her Italian-American roots have guided the direction of her cheesemaking. She looks to Italy for inspiration in the cheese room, all the while crafting products that will be unique to Boxcarr. An aged cow and goat mixed-milk cheese that's dipped in beeswax. Bright and sassy, it's perfect for summer. An ash-dusted wrinkly rind protects a slightly chalky but silky interior that is both luscious and zingy. We find gentle almond and bright mushroom notes in this cheese that is named after one of our most beautiful and powerful goats, Momma Rocket. Despite the origin of its name this is an all-cow's milk cheese. Boxcarr named this cheese Campo not only because the word means "field" in Italian, but also because it conjures the sensory experience of a campfire gathering. Campo is the edgy younger sister of Lissome, hiding unexpected maturity. Using a similar, all-cow's milk recipe, they take the young cheese that would become Lissome and instead cold-smoke it, preserving its youthful flavor while also imparting a smooth but noticeable smokiness and depth. Cottonbell is a variation on the recipe used for one Boxcarr's most popular cheeses, Cottonseed. Cottonbell is available from December 1 to May 1 and uses cow's milk only (thus the name - cows wear bells, so Cottonbell). It's slightly milder than the Cottonseed and is a richly satisfying treat, with a delicate rind and a creamy center. Enjoy it with a fresh baked baguette, some flavorful jam, and a glass of wine! This smear-ripened and aged cows milk cheese is reminiscent of a Taleggio, however, we wash our buttery exterior with our favorite Piedmontese birra, Clan!Distino? from Carussin. The striking rind has a kiss of funk and meatiness in its aroma, and a surprisingly mild, semi-firm, savory and creamy interior with supple and complex fruit notes. Nimble is a mixed-milk cheese similar to Lissome, made with half goat's milk and half cow's milk. It is slightly firmer in texture and like Lissome, it also has a beer-washed rind, and a creamy interior that melts in your mouth. They add a dark brew from their friends at Mystery Brewing when they add the culture, as well as washing the rind in beer, to add a unique richness to the flavor. This version is a little funkier, with the goat's milk adding a savory element at the end of the bite.